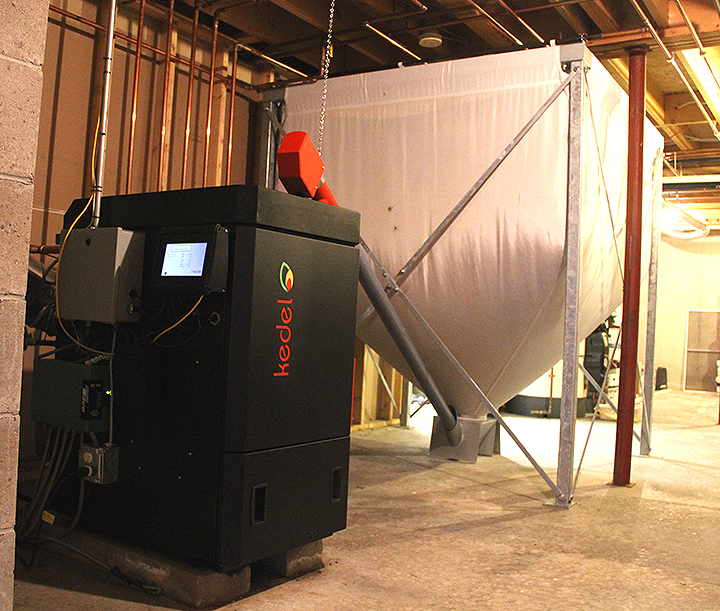 A Kedel Wood Pellet Boiler installed in a Portland basement, ready to take on winter. The “silo” or “hopper” on the right holds up to three tons of wood pellets, enough to last a typical household 2 to 3 months during the heating season. A Kedel Wood Pellet Boiler is the comprehensive solution that can completely replace your current fossil fuel heating system. Kedel boilers are fully automated wood pellet boilers that use your home’s central heating system and have a proven track record of cutting heating fuel costs by 40-60% and CO2 emissions by a remarkable 90%. With state of the art design, smart controls, automation and demonstrated efficiency, Kedel is the best choice for heating a home in Maine, where our forestry industry makes wood pellet heat inexpensive, virtually carbon-neutral, and renewable. Plus, when you heat your home with wood pellets sourced in Maine, your fuel dollars support our state’s economy, helping to keep Maine’s communities healthy and strong. Your Kedel boiler will produce ash from burning wood pellets. How a pellet boiler processes and stores that ash will determine how often you will need to head down to the basement to empty the ash. The Kedel RTB has an ash compaction feature that compresses loose wood pellet ash down into a covered bin, and allows you to burn 2 to 3 tons (4,000 to 6,000 pounds) of pellets before having to empty the bin. This means that the average homeowner will need to empty their ash bin only 2 to 3 times a year. The Kedel RTB features an automatic air compressor burner and heat exchanger cleaner. This prevents the buildup of ash inside the burner head and heat exchanger by blowing compressed air over the components. Not only does this reduce the frequency at which your boiler must be cleaned to once a year (which True North takes care of during our annual service) but allows for more efficient performance overall – which translates to saved heating dollars for you. Your Kedel utilizes the maximum amount of heat possible from the wood pellets it burns, and as a result, the exhaust that Kedel discharges exits the boiler at temperatures under 300 degrees, which is significantly lower than any other pellet boiler on the market. What this means is that more of the heat that is generated from your pellet fuel is going to heat your home rather than being sent up your chimney, once again helping you to keep your heating dollars where you want them: inside your home. The smart controls driving your Kedel’s performance utilize an oxygen sensor to keep your Kedel wood pellet boiler performing at its best. The sensor lives in the exhaust of the boiler and measures the oxygen levels of the air passing through. Based on the oxygen level, Kedel adjusts its performance to ensure that the mix of air and pellets in the combustion chamber of the boiler is optimized to give you the most heat for the least fuel. As your boiler approaches its annual cleaning, there will be more soot in the chamber and the oxygen sensor will adjust the environment to compensate for any restrictions in the chamber from ash buildup. Most pellet boilers are able to modulate output in 10 to 20 “steps,” or levels, over a heat range of 30% to 100% of the boiler’s output. Kedel takes this technology to the next level by creating step-less modulation from 10% to 100% power. In other words, Kedel adjusts its output to match the demands of your home so keenly that the burner can create 90 unique power levels outputting between 10% and 100% of the boiler’s heating capacity, creating unmatched efficiency and accuracy. Kedel’s web-enabled touch screen controller supports an array of functionality that ensures that your Kedel is completely customized to your needs. It can activate/deactivate your burner, clean the compressor and manage hot water priority, among a host of other smart activities. Easily connected to the internet through a LAN connection, your Kedel can then compensate for changes in weather, and send you emails alerts. If you’re traveling, you can check in on your Kedel to make sure your home is safe and your boiler is functioning optimally through a unique online visual interface and mobile app. True North monitors all of our boilers after installation and adjusts parameters to achieve optimum efficiency as well as diagnose and often correct errors remotely. We know what you’re thinking, and yes, it’s pretty darn cool. The Kedel boiler vessel is warrantied for 30 years and the parts for 2 years. True North warranties all of our work for 1 year and has a 24/7 service department that is always available. Fueled by wood pellets, a local and abundant renewable fuel, Kedel can save you up to 60% on heating fuel costs. The average Maine home uses 800 gallons of oil per year. At $3.00 per gallon (oil prices change frequently; click here to see the current price of fuel oil), the average home could save $1200 or more per year in heating costs. True North has chosen to work with the Kedel Wood Pellet Boiler because we believe it is the best price-quality combination available in an automated wood pellet boiler. The cost to install Kedel ranges from $12,000 to $18,000 and most homes qualify for up to $5,000 back in rebates from Efficiency Maine, bringing costs down even further. Get started today! Call us at 207-221-5677 or email us to find out if Kedel is right for you. Already own a Kedel? Tell us all about it! And don’t forget to sign up for our newsletter to receive information about insider perks for Kedel users.